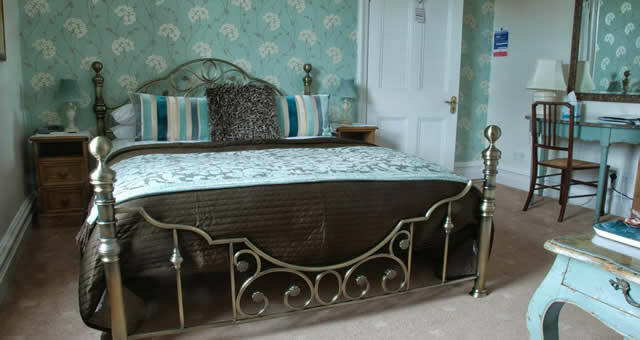 Denehurst Guest House015394 44710 work Guest HouseDenehurst is a traditional Lakeland stone house built in 1898 and full of Victorian charm and character. Situated in a quiet area away from the main road and with ample and convenient parking, we are just a 10-minute walk from Bowness and the lake. The bus and railway station and the village of Windermere are a similar distance away. Each of the 7 bedrooms are individual in style and colour All the rooms have colour TV/DVD refreshment tray, radio, hairdryer, not forgetting the teddy! Our superior rooms also include bathrobes, complementary toiletries and bottled water. We provide high standards of food and accommodation. The service we offer is personal and professional but in a relaxed and friendly atmosphere. We want you to enjoy yourselves. Denehurst Guest House limits booking to multiple nights on Friday Saturday. King size bed. TV/dvd player. Bath robes. Mineral water. Toiletries. room 1 limits booking to multiple nights on Friday Saturday. 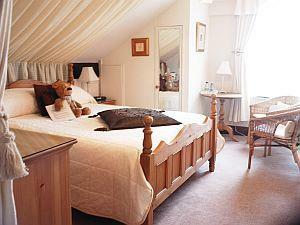 Superior double or twin room. TV, DVD, robes, mineral water, toiletries. room 2 limits booking to multiple nights on Friday Saturday. Four-poster room. TV, DVD, video, robes, mineral water, toiletries. room 3 limits booking to multiple nights on Friday Saturday. Superior double room. TV, DVD, robes, mineral water, toiletries. room 4 limits booking to multiple nights on Friday Saturday. Denehurst is a traditional Lakeland stone house built in 1898 and full of Victorian charm and character. Situated in a quiet area away from the main road and with ample and convenient parking, we are just a 10-minute walk from Bowness and the lake. The bus and railway station and the village of Windermere are a similar distance away. Please note that we only take a minimum of 2 nights stay at weekends and 3 night minimum stays at Bank Holidays, We do charge a single occupancy of a double room fee on top of the quoted rates. DVD players available in all rooms. Children welcome from age 12. Leave the M6 jct 36, follow the A590/591 signs for Windermere. Turn off the A591 into Windermere village. Follow the road to Bowness and the lake. Queens Drive is 0.5 mile down this road on left. Denehurst is at the top of Queens Drive on the right.